Recently young Ukrainian fighters of the SC “Borets” / ZR Team Ukraine have performed at the international championship “Abu Dhabi World Professional Jiu-Jitsu Championship 2018”. The event will last until 28 April at the sport arena “Mubadala Arena” in Abu Dhabi. According to the results of the “Abu Dhabi World Professional Jiu-Jitsu Championship 2018” Ukrainian fighters took gold and two silvers among children and juniors. Igor Tenenyk became the champion in the category of 54 kg among the orange and green belts. Vladislav Danchul is the silver medalist of the championship in the category of 34 kg among yellow belts. Vladislav managed to win the fight with the score 7-0, despite the fact that 30 seconds before the end of the fight he received submission from his opponent. Kostya Zhyvanov became the silver medalist of the championship in the category of 30 kg among grey belts. Kostya showed incredible will-power during the fight. He took his silver despite the fact other participants of his category were two years older. Nikita Petushynskyi didn’t take part at the “Abu Dhabi World Professional Jiu-Jitsu Championship 2018” because of his age. It should be mentioned, that shortly before the championship Nikita successfully proved himself at the “World Jiu-Jitsu Festival 2018” tournament. The leader of the Ukrainian youth team SC “Borets” / ZR Team Ukraine Serhii Krasovskyi yield the championship to the Brazilian during the second fight. 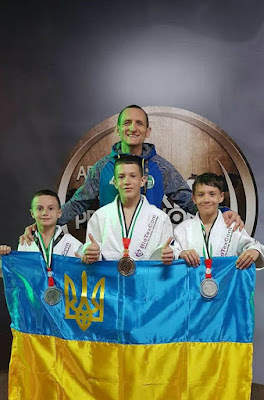 But the coach of the team Ievgen Skyrda noted that Serhii performed in the top category among juniors of the blue belts for the first time. The coach also mentioned that Serhii Krasovskyi has demonstrated the high level of his professionalism in jiu-jitsu sport!